Pino travel trailers were brought to the market by Turkish visionary, designer and accomplished musician- Mr. Faruk Karatan. 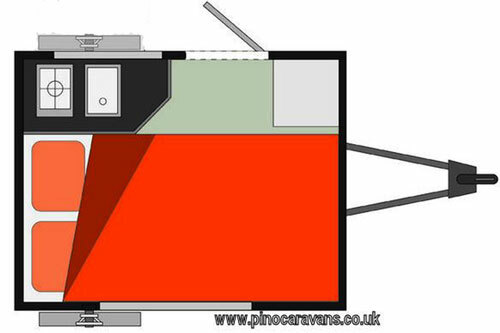 Designing Pino campers, he combined the best practices of the Turkish boat industry (light, watertight and robust designs) with trends observed in “Western” RV industry (elegance, suitable features and safety). The result is the series of Pino campers ranging from the smallest model Pi (length of just 210cm/6’11”) through models P325, P375 to the longest one P425 (length of 425cm/almost 14’). 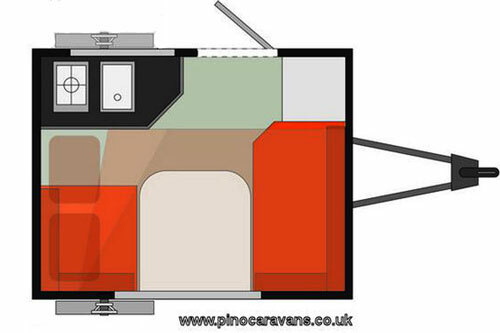 The collaboration with the UK-based company Pino Caravans opened western markets. 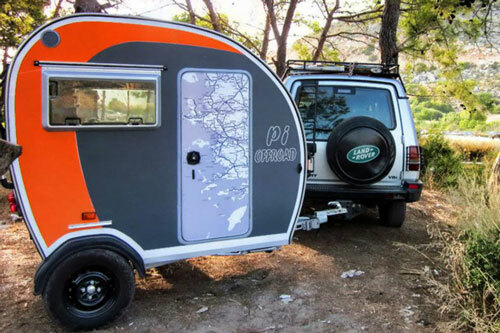 The model Pi is an example of a Mini (if not Micro) – travel trailer. Yet with its dimensions of only 6’11” x 5’7” is still provides decent set of features. Dinette with seating for four converts in double bed for the night. 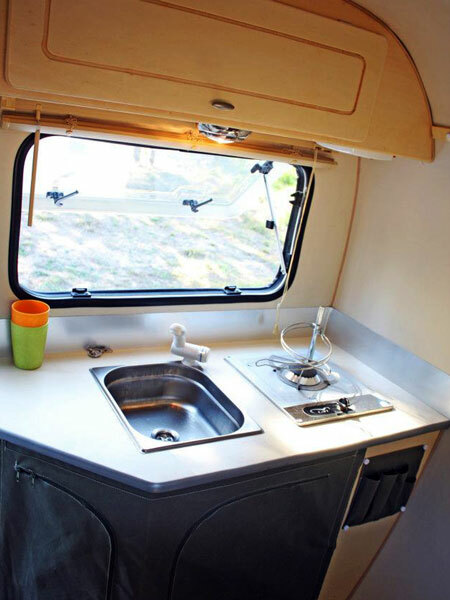 The small galley includes stainless steel 1-burner cooktop and single bowl sink with tap, cabinet with laminated worktop and drawers, overhead cabinet with an electric hood. Optional LPG installation, water tanks w pump and electric cooler complete this modest cooking area. The portable toilet has its place in the storage and certainly will be welcomed by most nature lovers exploring out of civilization areas. The camper’s shell is made from fiberglass using a unique multi-layered ply-sandwich process (similar to the one used in the marine industry). The result is a thermally insulated, laminated, watertight and robust shell that will last almost forever. Thanks to optional gas (or diesel) heater the Pi camper can provide warmth all year round. 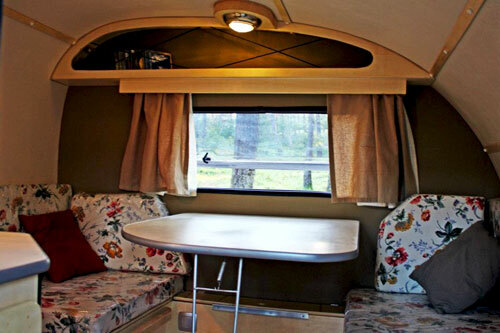 Long list of options including (on top of these mentioned above) water heater, entertainment system (TV and Stereo), solar power, awning, bicycle rack … ( to keep it short) offers decent comfort given camper’s micro-size. The mentioned awning helps to extend the living space into the nature, while bike rack to explore unbeaten tracks and narrow paths inaccessible for cars. It is worth to mention that the Pi model is also available in an Off-Road version helping adventurers to explore unspoiled corners of the Mother Nature. 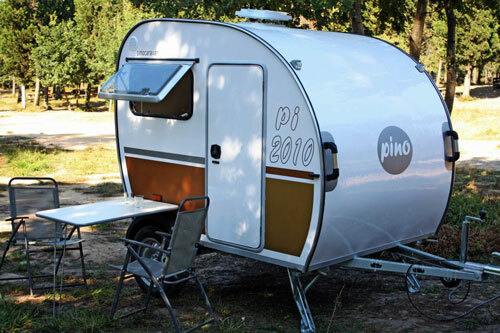 Pino Pi travel trailer: day (above) and night (below) configurations. Obviously light-weight designs (dry weight of only 660 lbs), the Pi travel trailer can be towed by most compact cars. And what’s important - the road-experience will be friendly. The Pi travel trailer is small enough to guarantee very good maneuverability and good economics (easy on fuel), but at the same time “large” enough to provide decent camping conditions. The company is open for customization and offers large range of fabrics, vinyl, exterior graphics and colors. Their goal is to offer you Pino travel trailer in “your way” version.